The copy email function is a useful and time saving tool. Copying an email will create an exact duplicate of the original including its content, layout, template, links, and images. 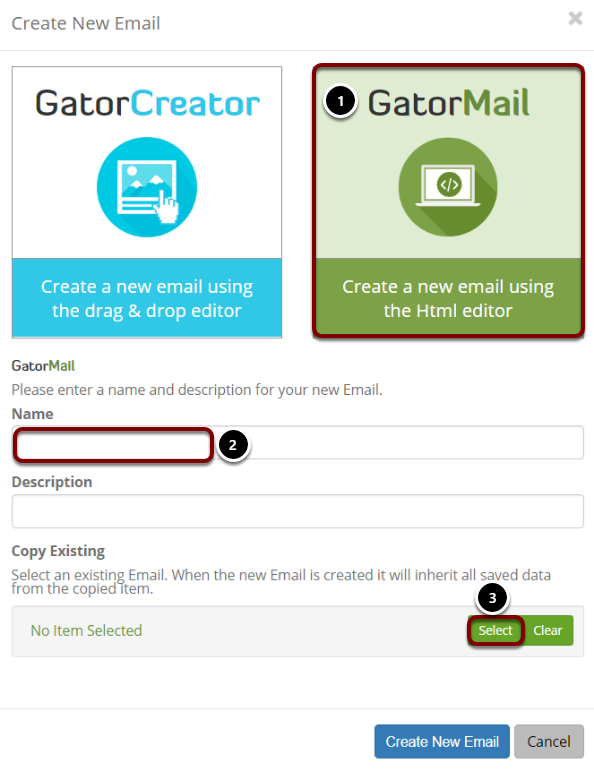 If you wanted to create an identical copy ofa previous email you could do this by using the copy function. Then you would need to tweak the contents to your new specifications. 'Add New Email' - To copy an existing email, start by clicking here. Once you have clicked the copy button a pop up window will be displayed (as shown above). From here you can search for previous emails via the filter button, or by looking through your file directories on the left hand side. Once you have found and clicked on the correct campaign/email, you will be returned to the previous menu. To the left of this, choose the name of the file as you normally would when creating an email. Please make sure to use clear naming conventions when creating your duplicate emails.